I absolutely love the way the pomegranates instantly add a festive ‘pop’ to this dish. Brussels spouts remind me of my childhood, but this dish is so much nicer than any of those I remembered. Pre-heat oven to 375 F / 190 C.
Wash and Trim brussel sprouts then cut in half. Arrange on a baking sheet and toss with oil and salt and pepper. Bake for 30 minutes or until lightly browned. Take out of oven and let rest until cool. Meanwhile, combine balsamic vinegar and orange juice in a saucepan. Bring to boil, then reduce heat to medium-low and reduce, about 15 minutes. Drizzle the balsamic reduction over the roasted sprouts. 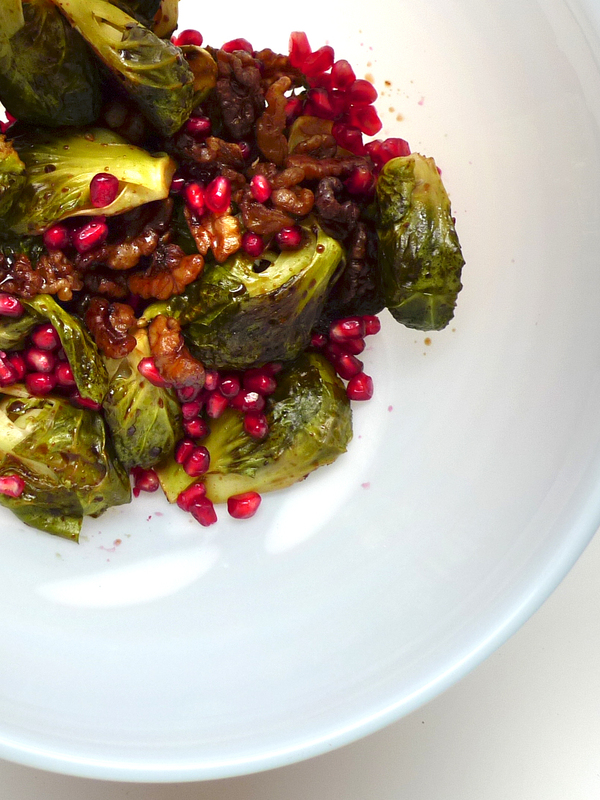 Toss pomegranate and walnuts with sprouts. – Maple Syrup can be used in place of orange juice. This will reduce very quickly so be careful not to burn the reduction.